Facebook reinvents itself to ward off its competitors. Posted September 23rd, 2011 by Karl & filed under Social. For those of you who have just heard the news and want a piece of the action, you can reinvent your very own Facebook page by following this guide on TechCrunch. It’s been a busy week for the social medialets Facebook and Google+, perhaps particularly more so for the former. It’s certainly been a more successful week for Facebook, with the news of it’s features plastered all over TechCrunch and Mashable with little or no mention of G+’s exploits. One of the more notable additions to the Facebook infrastructure is the Timeline feature, which orders all your Facebook feats in descending chronological order. Facebook themselves have been advertising the new Timeline feature as a way of displaying your entire life on your Facebook page. Although it is theoretically possible to do this on the new Timeline interface, it’s also something that would probably take some time to do, which probably means that not many people will. 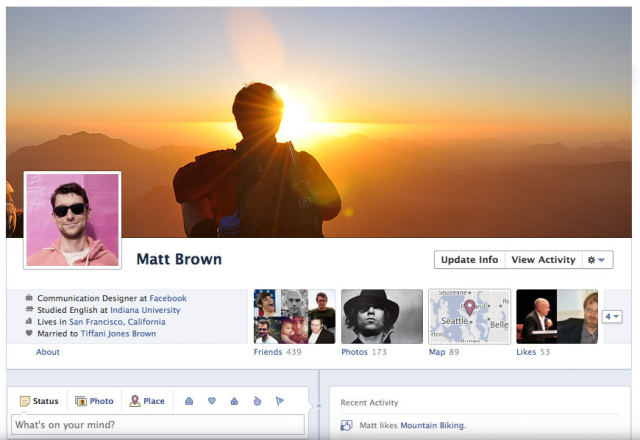 Still, Timeline provides an intuitive method of displaying your own Facebook profile and history. Looking at my own Timeline and viewing my history in this way kind of reminds me of when I discover some old school books or pictures and start to reminisce. Of course, this could all be a flash in the pan with the novelty of a new Facebook wearing thin quickly; but given the general reaction to the new feature, I doubt that will be the case. You can now [verb] a [noun] – No longer is Facebook stuck to the stoic “like” function. You can now “read” a “book” or “eat” a “sandwich”. Occasionally, you can even “go” to “bed”. Facebook apps need only ask once – Now when you authorise Facebook apps, they will be able to share information on your feed without having to ask you each time. Trivial stuff slung to the “ticker” – In line with the above point, all content that is deemed unimportant will be fed to the ticker, out of the way of the main news feed containing information people would prefer to see, such as status updates, new photos and so on. Music, movie, news and TV integration – By adding certain apps to your Facebook account (such as Spotify), you can now use them inside of Facebook itself. Every time they update, they get added to the ticker, so that others can view and share the experience. In response, Google has also announced some new features to it’s own social network platform. The major new feature of which for Google was the Hangout service, which allows for live video conferencing for up to 10 participants; a service that Facebook currently doesn’t offer. Although still in it’s infancy, initial reaction to the product was good with an official showcase with will.i.am from the Black Eyed Peas. If Google+ has any chance of surviving Facebook’s new wave, it’s going to have to release it’s self more publicly and more quickly. It has already gone one step to achieving this by making its service a public beta, meaning invites are no longer required. Which one of the two main Social Media competitors will win the social is yet to be seen, with one pundit suggesting that although Facebook will buck the initial trend, Google+ could make a comeback later. Either way, Facebook has certainly made the brighter start.